Perhaps you missed the sold out Arts and Cultural Summit in Vancouver last weekend? Well you are in luck, they videoed the whole thing and have posted it for you (I start speaking at 2 hours and 35 minutes if you want to avoid my yakity yak. I do talk about some art historical models and what Portland has done well and not so well. Vancouver seems interested and the person in charge of the national park section of the Fort is the same person who helped the Headlands center in the bay area form. An interview with Gregory Green in his installation on Sunday. The voice of the New Free State of Caroline 96.7fm Portland Oregon. A .5 watt "pirate" radio station for the period of 09/06/09 -12/13/09 stationed in the Hoffman Gallery at Lewis and Clark College. Sure, some of the work leans heavily on that old "failure fetish" crutch that's so so art school but Gallery Homeland's "Incompletely" opening last night was worthwhile... not some utter failure. There are a lot of smart shows coming down tomorrow like Anna Gray and Ryan Wilson Paulson's Pearl District debut and the Lesbian Art Show, but Green Oregon at PNCA's Izquierdo Gallery deserves special mention. What's more, Green Oregon is a tightly curated show in a interesting space with some excellent artists like Robert Adams, Patrick Rock, Justin "Scrappers" Morrison, PORT's own Ryan Pierce, Marne Lucas and the region's dean of eco art Bruce Conkle, etc. For me Bailey Winter's painting is the standout. It is anguished over the environment, just plain weird... conjuring both David Lynch and John Wesley and most likely extremely stoned. The effect is troubling, frank, omnipresent and a bit overwhelming... which is exactly like having a discussion about ecology and art the related to it in Oregon. Check it out. Though 1st thursday's openings were a bit conservative this month (lacking the excitement and sales of new artists like Eva Speer and PORT's Ryan Pierce last month... except Chambers) shows like Matt King at Fourteen30, Damien Gilley and Ethan Rose at Gallery Homeland and Stephen Slappe etal. at The Art Gym made for memorable openings that would have added "zing" my recent New York trip. Nice to know Portland still stacks up and is showcasing interesting new talent. An excerpt of the Winter Solstice Puppet Collective's performance last night for the packed opening of Vanessa Renwick's House of Sound. The Evolutionary Jass Band is providing the live soundtrack. Normally, PORT doesn't care that much for parties that make it impossible to see the show, but this packed feel good get together shows just what a diverse crowd a warehouse show in Portland's art scene can bring. Lets see: lots of artists, too many hipster party goers, some professors and a few major patrons can be seen here. It looks like a nice show and I'll come back later to check out curator/artist Jhordan Dahl's handiwork when I can actually see the show. Till then enjoy this video art scene rollercoaster. 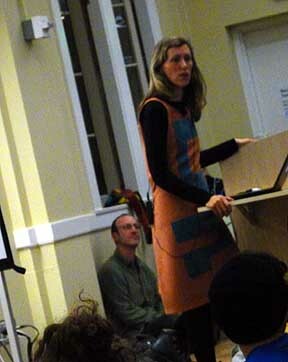 For those who missed the Andrea Zittel lecture at PSU last Monday, it definitely kicked off the 2008-9 PMMNLS lectures series with a bang (but we video'd part of it for you). Overall, a gloriously absurd exercise... especially the live interview between Mack McFarland and Kate Mondlach taking place within the studio less than 40 feet from the TV's. For more context here's Amy's review of the BYOTV show at NAAU. Portland's art scene just keeps getting more (and better) alternative spaces, here were a few of the openings from 1st Thursday and First Friday. Needless to say The Everett Station Lofts have really become an interesting enclave once again after their previous heyday in 2003. It also reminds me why it's ridiculous to try to contain all of this activity under one roof (it can't be done)... Portland is better off with 30 interesting spaces rather than 1 large ponderous space that tries to be everything to everyone. Igloo, though tiny has turned into one one of the most energetic new spaces in Portland. In general the Everett Station lofts make the Pearl ditrict look tame... all you have to do is cross NW Broadway to catch these spaces which are open much later. Portland has a very active art scene that continues to expand... blah blah.. you know this already. I also think last weekend was the first time in recent memory that First Friday/Saturday competed on all fronts with First Thursday. Here were some highlights. Solid as ever and always changing, Tom Cramer is a bit of a Portland institution (with all the murals, cars, gallery shows and set designs) and after writing reviews and an essay 2 years ago I felt Tom himself might be the best one to introduce his latest show at his new gallery, Laura Russo. At this point in Tom's career a museum survey is about all the more he needs, the work is still jaw dropping, still selling like hotcakes to collectors (for more than before) and still evolving. As an artist he's shown no signs of running out of steam and he's an important bridge between the old Portland art scene (Milton Wilson, Clifford Gleason, C.S. Price) and the newest version streaming in from all parts of the globe. That said, just another review or yet another chat with Tom interview seemed less interesting than this little introduction to what is different and new in his latest work.